Lancaster County received its first significant snowfall Wednesday – about 9 inches of the stuff. So on Thursday afternoon, Bruce and I packed up our cross-country skis and headed to Nolde Forest, only 20 minutes away on Route 625; actually it's just over the border in Berks County. There’s no better place to appreciate the beauty and romance of the snow than among the towering pines, planted over 100 years ago. When hosiery baron Jacob Nolde acquired this area in the early 1900s, there was but one single white pine. Inspired by this tree, the German-born Nolde hired an Austrian forester to create a coniferous forest. Now it’s one of the few places around where you can enjoy over 600 acres of century trees. There are trails, occasionally marked when they cross each other. We just followed the tracks left by some hikers. Once off the road, the forest becomes very quiet. Occasionally there’s a group of birds, the gurgling of a stream, or a call from Bruce as he waits for me while I play with the camera. Big puffs of snow, falling from high tree limbs, float to the ground silently. Turn in any direction and you'll see majestic trees reaching skyward. And the snow is so pristine, it looks blue. Thank you, Jacob, for having the insight to create such a beautiful place. Nolde is a well-kept secret – in fact, we only saw two other folks the entire time we were there. So, grab your Valentine, pack your skis or hiking boots and your backpack and we’ll fill a thermos with hot chocolate, pack up some cookies and send you on your way for a romantic afternoon. Go Ice Skating. New York has one. So does downtown Cleveland, and now Lancaster has one, too—its very own ice rink. Skating is depicted on countless Christmas cards throughout the years, a romantic way to spend an hour or two. Yep, we’ve skated here at Clipper Stadium. No skates? No worries – they rent. Or stop and build a snowman, Lancaster has many parks with all the snow you’ll need. We found this one on the way to Nolde - just past the Amish schoolhouse. I couldn't resist giving it a hug. Of course you can look forward to coming back to the inn to soak in your own Jacuzzi, and sit in front of the fireplace. Ah, the best part of winter is warming up. And don't worry about a little bit of snow - The Artist's Inn is located on State Route 897, so our road is nearly always clear. For more romantic ideas for Valentines’s Day – or any day, see our January Blog, "25 ways to add romance to your getaway in Lancaster County" from last year. It was just before Thanksgiving...and I could hardly believe that beautiful red Lancaster tomatoes were still for sale at some of the farm stands. They called to me each time I drove by. I had already made my sauce (or gravy as they would say in Jersey), and bags of it were waiting in my freezer for winter meals. I really had no plans to stop – no reason to stop. But how many November days will ever come again when I could still buy farm fresh tomatoes? Tomatoes so red that you know the sun personally kissed each one of them. And so I loaded the box into the back of the car. So I’ll post it now, and as I look out my window at the fresh fallen snow, I’m so glad that I took the extra time to pick up those tomatoes. I made a lot of sauce and some soup – and froze what we couldn’t eat for cold winter days. One of my favorite ways to make soups, vegetables and appetizers is to roast them. It fills the inn with wonderful aromas, warms up the kitchen and brings out the best in flavor. This recipe is so solid that you can even use winter tomatoes – distant cousins of those summer beauties. So, from one kitchen to another, I hope you enjoy this simple recipe. Add some crusty warm bread, a hearty red wine, a good cheese...ah, sounds like dinner to me! Wash, cut and get rid of as many seeds from the tomatoes as you can. Place tomatoes, garlic and onion in ceramic roasting pan. Sprinkle with salt and pepper and pour olive oil back and forth over entire pan (I’m guessing about ¼ of a cup). Roast for about 40 minutes, until onions are browned and tips are starting to blacken a little. Remove pan from oven. In a large stock pot, boil chicken stock and bay leaves. Add butter and tomato mixture. Turn down the heat to a simmer for about 30 minutes, or until liquid is reduced by a third. Add basil and puree the soup with an immersion blender. Add cream, adjust salt and pepper and serve. About fourteen years ago, just after we had purchased The Artist’s Inn, I was out and about and needed mustard for dinner. I drove by a shop on Route 23 in Goodville that had an A-Treat Soda sign. I assumed that they would carry food, parked the car and went in. I couldn’t have been more wrong. When I opened the door, the little store nearly exploded with bolt upon bolt of fabric. Or maybe it was the number of women busily gathering up their selections that made it feel so crowded. And then there was the (pretty loud) Christian music playing. It seemed all my senses went on overload at once! I had not only opened the door to a store, but to a way of shopping long forgotten. Penny candy, children’s books, a pop machine, and squished in the middle of it all, a tiny desk with a cash register. That was just in the first five feet! ﻿One thing I was certain – there was no mustard in sight and I was beginning to doubt that I would find any. But mustard was quickly forgotten as I set off to explore another one of Lancaster County’s hidden gems. This was a quilter’s delight. And though I don’t quilt, I can sew and do get “fabric fever”. Just look and you will find it. One might think the store is jam-packed and crowded, but don’t for a minute think it’s unorganized....I’ve seen people request a certain pattern in apple green and Nan can find it in a heartbeat. Nan is the owner – she inherited the store from her parents, and her grandparents before that. She officially started working at Obies in 1975. 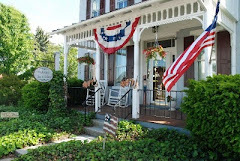 The store was originally built by a ship-builder in 1830. There’s a huge lighting fixture in the shape of an anchor – it hangs from the ceiling through two stories. This is old-fashioned shopping on a personal level. You talk, they listen. You both laugh. You explore, they wait patiently and offer helpful suggestions. There are about five thousand potholders – made right at the store. Upstairs there are about 300 large quilts in stock and about 60 wall hangings. Quilts, quilts and more quilts! ﻿﻿Don’t see anything that you like? No problem – they’ll make one for you. Just go downstairs and pick out the fabric. Since my first discovery, I’ve sent scores of guests to Obies – some order quilts to have them shipped all over the country, others purchase material that they had long ago given up ever finding again, and mostly men go just for the experience. They all marvel at what they find.